It's day two of the rainbow tights challenge, and today I am in bright yellow. I've paired them with one of my favorite dresses, which is black and brown and gold, and my super warm green cardigan. I took the belt off the cardi and tied it around the dress, and added my layered chains. Years ago, I hated yellow, but now I love it, and embrace it. I love the brightness it adds to the outfit and to this cold winter day. 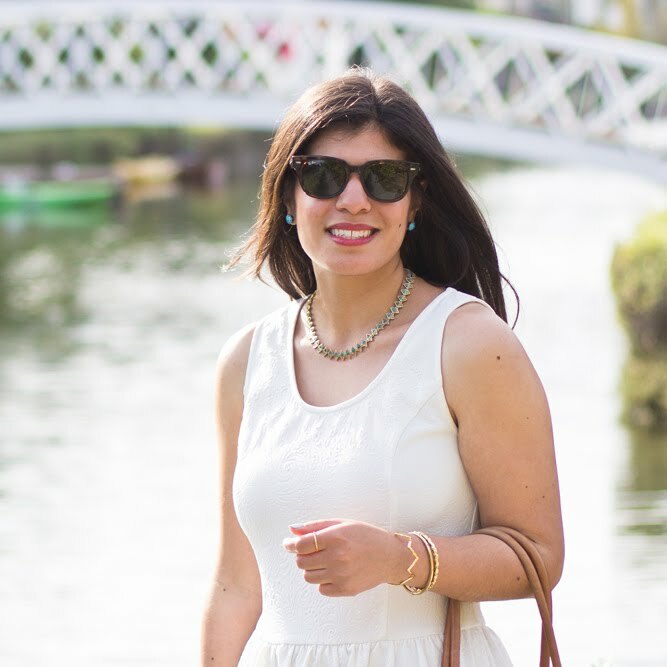 Before the blog, I don't know that I could have worn yellow tights, to school, to work - but now I can make bold fashion choices and not worry about what others might think. I made a very delibrate choice to not wear knee high boots this week to better show case the tights. Love the look of the yellow tights with this dress! 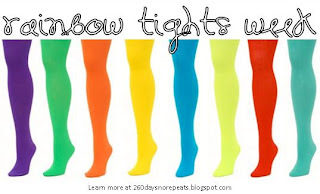 I also lovethe idea of therainbow tights challenge... I love pairing colored tights with unexpected outfits! Yeah I think the yellow tights are my favorite this week! I'll be honest I don't know if I'm going to make it to work tomorrow with all the snow that is supposed to happen. I really like those yellow tights, great choice on pairing it with the sweater and dress. I'm surprised you're rocking such cute shoes in the snow. I wear winter boots en route to and from work - then just change when I get there. No need to get real shoes icky. I love the yellow tights - you're making me want to run right out and buy several colored pairs because they just look for fabulous! Wow, you styled those tights well, brave move on bright yellow! Love the little ankle boots too. I found your last post funny too, I think I own too much black as well! You should ban yourself from buying black entirely and see how colourful your closet is by the end of the year! p.s. good luck with your snow day tomorrow! You have styled these tights to perfection! I'm sort of wishing I'd bought a pair of yellow tights before starting GAAD. Ah well. What a cool looking dress, loving that pattern! Ahh, you're making me need to pull out my yellow tights and wear them! I can't believe I haven't worn them yet this winter, srsly. WORK DEM TIGHTS GURL. I love them with the boots. Aaaaaand your hair is super curly and pretty. now I NEED a pair of yellow tights too! love the way you styled them! And your tights are awesome! This outfit is SO cute! It's the perfect way to stay bright and sunny during the winter. And I'm so jealous of your ability to wear yellow! I think it's funny how we grow up loving one color and as we grow older our taste changes significantly. I'm glad that you like yellow now...one of my fave colors. Yellow tights are the absolute best. You're rockin' them! Yellow and the Betsy Johnson dress work perfectly! Adorable! I like yellow with greys and darker neutrals. This is such a sunny outfit. Crazy snow we got yesterday night, huh? But really not that bad. i love these tights too! you have quite a tight collection lady :) how did the snow storm treat you? Well, if it isn't one of my favorite dresses! Every time you wear this dress I swear I am going to look at the Avon catalogue.. and then I forget. I think the pattern and color are so pretty and look gorgeous on you. Thank you so much for the comment (: I hope you will follow my blog sometime. I just got these yellow tights and it's amazing how you wear them so perfectly. I love the dress. It's got my favorite evening wear combination....black/ gold. That dress is so pretty! I love how rich and luxe it looks! And the tights are cheerful! I love this dress on you, especially with these yellow tights. I have yellow tights but I never know what to wear with them. But, this, this is perfect. I never would have thought of this pairing, but I love it! I love the yellow tights on you, Lyddie!! Perfect with the dress and shoes you wore them with. So NOT winter. Yay! Such a beautiful dress....I love how you paired it with the fun yellow tights...great outfit! I really like your booties ... where did you get them? Love love love head to toe! it's perfect. And I seriously need to get some more colored tights. Stat. Cute! I <3 yellow tights!